The latest news from Northern Ireland Air Quality is shown below with the most recent at the top. 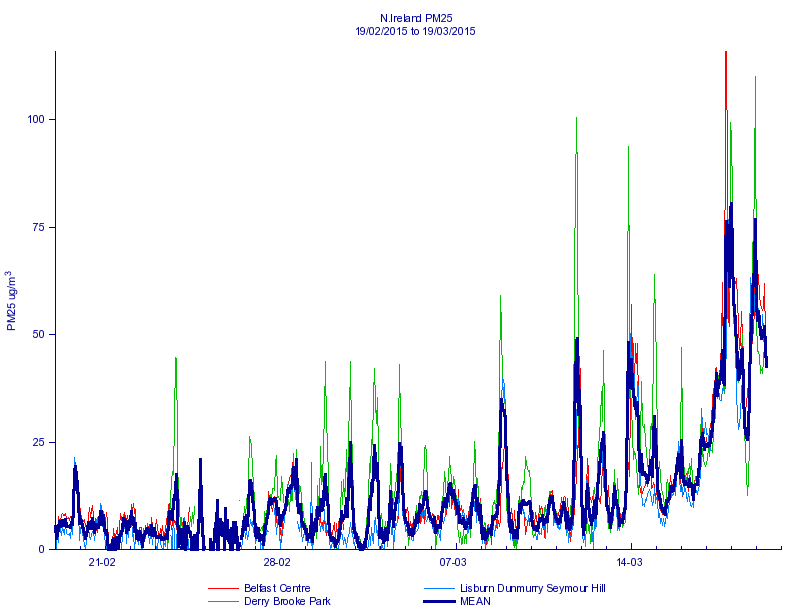 High levels of air pollution (particulate matter) are currently occurring in some parts of Northern Ireland. These high levels of particulate pollution are believed to result from local pollution sources, such as road vehicles and home heating emissions, combined with cold, calm weather conditions which mean the pollutants are not being dispersed. It is likely that we will continue to see these elevated levels for as long as the current weather conditions persist, possibly into the weekend. For more information, please see the DAERA high air pollution advisory notice at https://www.daera-ni.gov.uk/news/high-air-pollution-advisory-notice. 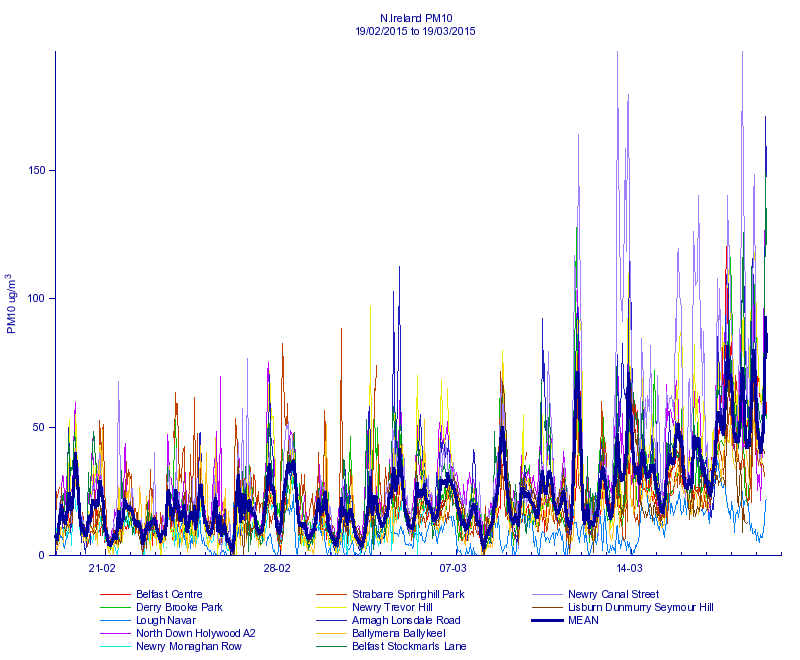 Yesterday (18th March 2015) elevated levels of particulate matter (PM10 and PM2.5) were measured by air quality monitoring stations across Northern Ireland. Concentrations of PM10 and PM2.5 reached the ‘Moderate’ and ‘High’ bands (as defined in the Daily Air Quality Index). This pollution episode is believed to be caused by the current weather and wind direction, which is bringing pollutants from mainland Europe. The poor air quality is expected to continue today (19th March 2015) before improving tomorrow. The latest Devolved Administrations Air Quality Pollutant Inventories report and data have been published and can now be downloaded. The Committee on the Medical Effects of Air Pollutants (COMEAP) was asked by Defra and the Devolved Administrations to review the Air Quality Index to ensure that it is fit for purpose given developments in the field of air quality. The current index has been in operation essentially unchanged for a period of around 12 years. COMEAP published the report Review of the UK Air Quality Index in June 2011. Defra and the Devolved Administrations have considered the report recommendations and will implement several changes, following consultation with index users. The implementation of the new index, to be renamed the Daily Air Quality Index (DAQI), is described in this letter.